In the last several years, much has been written about growing economic challenges, increasing income inequality, and political polarization in the United States. This book argues that lessons for addressing these national challenges are emerging from a new set of realities in America’s metropolitan regions: first, that inequity is, in fact, bad for economic growth; second, that bringing together the concerns of equity and growth requires concerted local action; and, third, that the fundamental building block for doing this is the creation of diverse and dynamic epistemic (or knowledge) communities, which help to overcome political polarization and help regions address the challenges of economic restructuring and social divides. Chris Benner is the Dorothy E. Everett Chair in Global Information and Social Entrepreneurship, Director of the Everett Program for Digital Tools for Social Innovation, and Professor of Environmental Studies and Sociology at the University of California, Santa Cruz. His research examines the relationships between technological change, regional development, and structures of economic opportunity, including regional labor markets and restructuring of work and employment. His most recent book, coauthored with Manuel Pastor, is Just Growth: Inclusion and Prosperity in America’s Metropolitan Region. Other books include This Could Be the Start of Something Big: How Social Movements for Regional Equity Are Transforming Metropolitan America, and Work in the New Economy: Flexible Labor Markets in Silicon Valley. Manuel Pastor is Professor of Sociology and American Studies and Ethnicity at the University of Southern California, where he also serves as Director of USC's Program for Environmental and Regional Equity (PERE) and Codirector of USC's Center for the Study of Immigrant Integration (CSII). 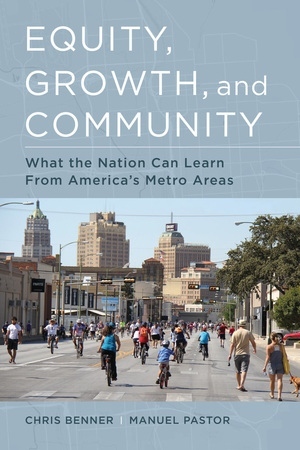 His most recent book, coauthored with Chris Benner, is Just Growth: Inclusion and Prosperity in America’s Metropolitan Region. He is also the coauthor of Uncommon Common Ground: Race and America’s Future, and This Could Be the Start of Something Big: How Social Movements for Regional Equity Are Transforming Metropolitan America.